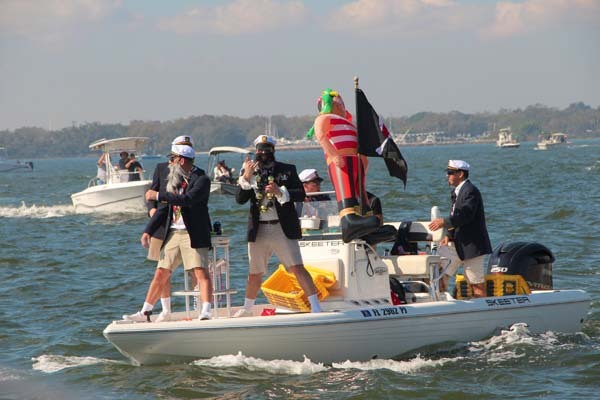 Tampa Bay’s dirty little secret is that its famed annual Gasparilla celebration is a fake. 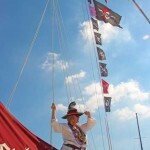 Jose Gaspar, the fabled pirate for which our celebration is named, never lived – he’s a tall tale at best. And his famed pirate ship that leads the Tampa invasionisn’t even a ship – it’s an unpowered barge! 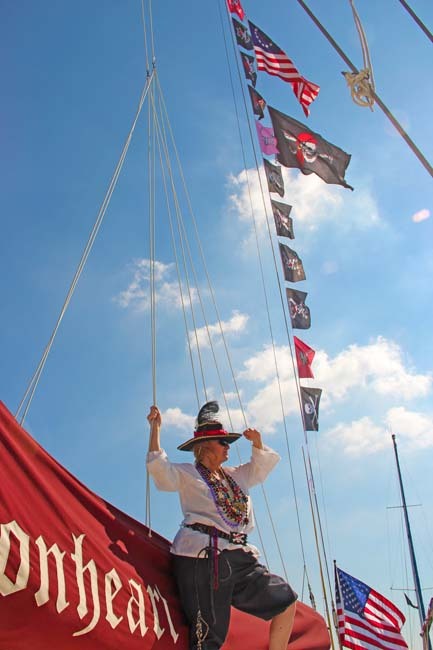 This year, however, city guests and residents alike will be treated to the real thing – a genuine pirate ship, under her own sails, straight out of history. At least that’s what the invading British called the Lynx and ships like her during the War of 1812. 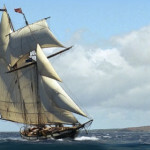 Lynx was one of the fastest of the “privateers”, extraordinary schooners that sailed circles around the massive Royal Navy and terrorized it’s merchant fleet. The privateers, owned and crewed by private citizens, sank many of the much larger British man-o-war ships and hundreds of their merchant ships along the Atlantic coast. The Royal Navy called the Fells Point area of Baltimore Harbor, where many of the privateers were constructed, a “Den of Pirates”. 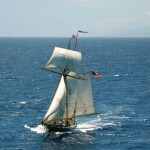 Today’s Lynx is of course not the original ship from the War of 1812 – only the Constitution survives today from that war. 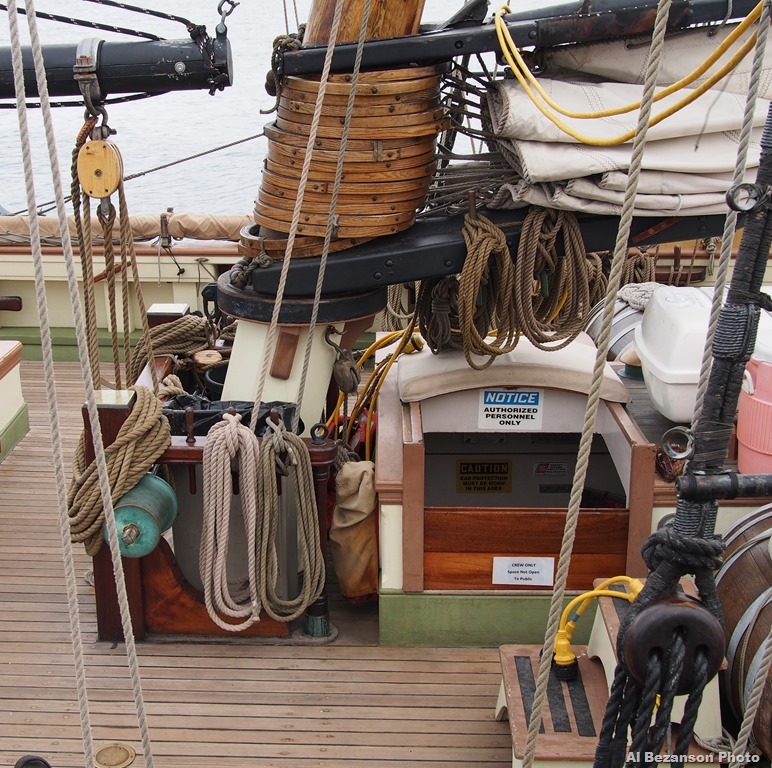 She’s a replica built in Rockport, Maine, and operated by the Lynx Educational Foundation as a living history museum to educate children and adults alike about American history through active sail training aboard a real wooden sailing ship. Lynx is armed with a functioning main battery of four six-pounder carronade and four swivel guns. 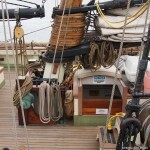 In addition, a complementary stand of historic small arms, for demonstration and instructional purposes, is aboard, including muskets, pistols, cutlasses, boarding pikes and axes. 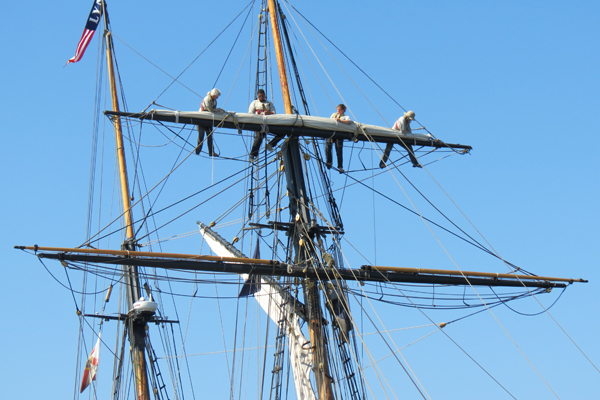 To maintain the historic integrity of the onboard experience, the permanent crew of Lynx wears uniforms and operates the ship in keeping with the maritime traditions of early 19th Century America. The Lynx is visiting at the Tampa Convention Center docks, near Lionheart’s berth, through Wednesday, January 22nd, then departs Thursday for a short stay in St. Petersburg. 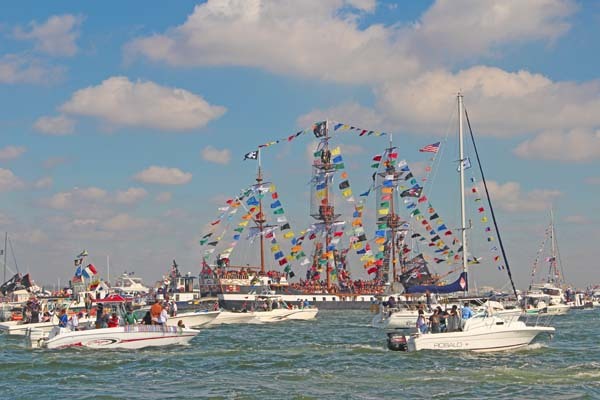 The Lynx will join the Jose Gaspar and the Gasparilla fleet on January 25th as they invade Tampa – watch for those tall masts and majestic square-rigged sails! 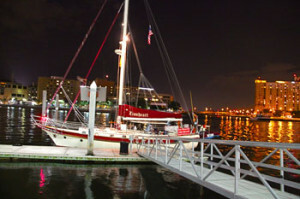 She will return to share the Tampa Convention Center docks with Lionheart for another ten days on February 17th. 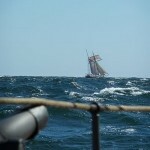 Then she’ll sail back to St. Petersburg, where she will remain until March 13. 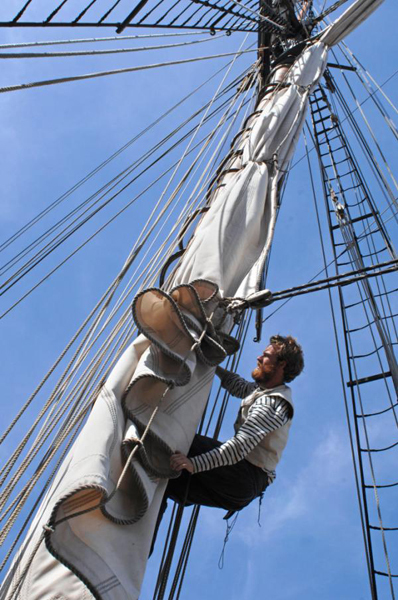 Don’t miss this rare opportunity to walk the decks of this grand tall ship. 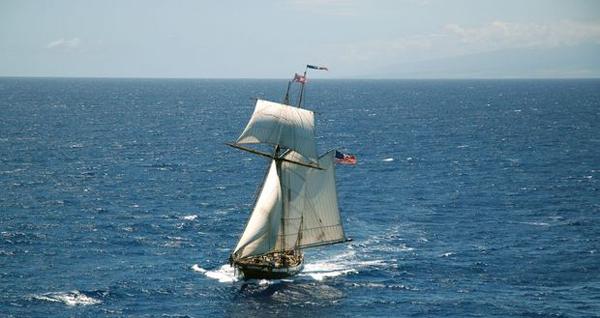 Better yet, go aboard for a journey back in time as Lynx puts to sea in the beautiful waters of Tampa Bay. 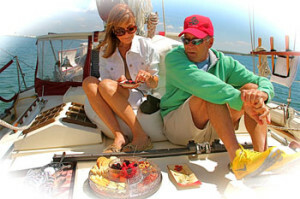 Numerous ship tours and sailings are scheduled during their Tampa and St. Pete visits. 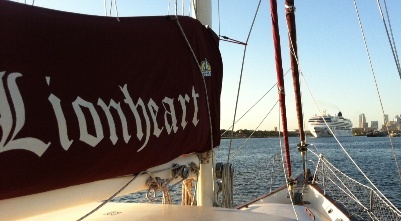 And plan a January or February cruise with Olde World Sailing Line aboard Lionheart, as she escorts Lynx throughout Tampa Bay. 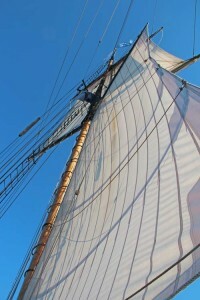 You’ll get unbelievable up-close pictures of Lynx under full sail. 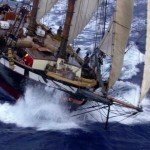 Learn more about the Privateer Lynx and her schedule at www.privateerlynx.com. The winter months in Central Florida are some of the most beautiful months of the year. The air is crisp and clear as well as the waters of Tampa Bay as summer algae dissipates. This year November and December have provided us many spectacular sails, brilliant sunsets, and abundant wildlife encounters. As many of you have experienced, Lionheart is often escorted by playful pods of dolphins throughout the year, frequently coming alongside a mere two or three feet from the hull riding our wake. But during the winter months the dolphins are joined by an influx of huge flocks of migrating water birds, including the rare white pelican. On numerous November and December sails we have encountered bald eagles as they dive for nearby fish. 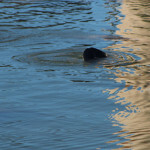 The most anticipated winter visitor, though, is the iconic manatee. These warm-blooded mammals, reputedly mistaken as mermaids by early sailors, look a bit like a walrus without tusks. Manatees are strictly herbivores, feeding on sea grass and other vegetation, and are very social animals. 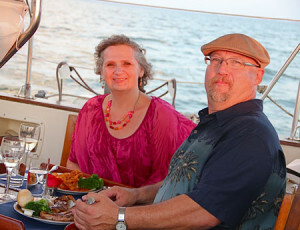 Sailing trip, thrilling our seafaring guests both local and out-of-state. But given that Tampa Bay is Florida’s largest estuary spanning around 40 miles from Tampa to the Gulf, spotting manatees is not an everyday occasion aboard Lionheart. The good captain, however, can point you to a very nearby “Manatee hole” where you’ll see wild manatees by the dozens – up-close and personal. 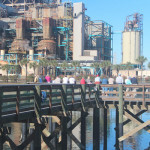 The Tampa Electric Power Plant, in Apollo Beach, burns coal to generate pressurized steam that drives their turbines. To convert this steam back to water, the plant pumps in cooler seawater from the bay. As the seawater interacts with the steam, it too becomes much warmer. 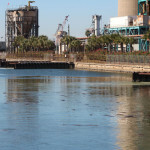 This warm seawater is then discharged back into a canal next to the power plant. Manatees like this a lot! Manatee Sanctuary In 1986 the state of Florida declared this canal an official manatee sanctuary. 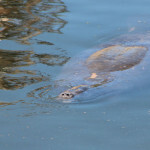 It is a winter hot spot for migrating manatees. The Tampa Electric Company has built a visitors center and beautiful boardwalk overlooking the canal. 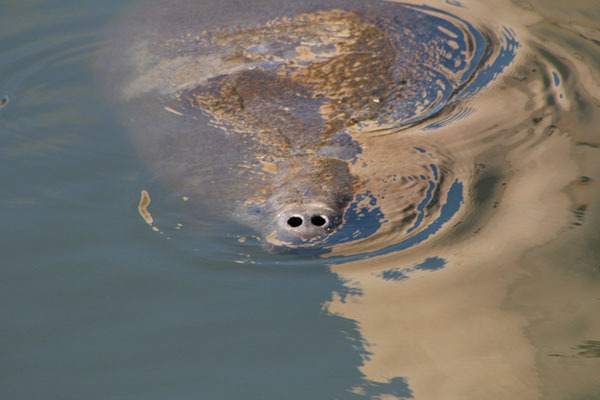 There you can learn more about manatees and walk out over the water to view dozens and dozens of manatees in their natural habitat. Take I-75 south from Tampa and exit at the Apollo Beach exit. A left hand turn from the ramp will take you directly to the Tampa Electric Manatee Viewing Area. There is no charge to enjoy this fabulous natural wonder. 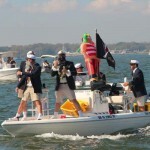 Tell them Captain Mac sent you (http://tampaelectric.com/company/mvc/). 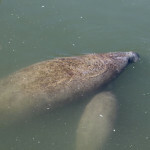 During 2013 Florida recorded more manatee deaths than ever before – 800+, vs. around 300 in 2012. Scientists are not sure the reasons for the jump in mortality, but injuries and death by speeding boats is one serious cause. 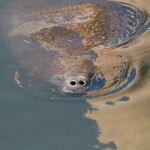 Please observe Manatee Zone signs when you’re on the water. One of the authentic and inspirational aspects of the craziness of Gasparilla this year was the surprising appearance of the tallship, Lynx. Unfortunately, not many Gasparilla viewers were able to see this great ship because her deep draft restricted her passage to the deeper waters of the Bay. 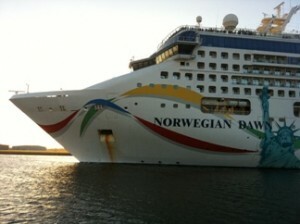 During Saturday’s invasion, on January 26, she departed from St. Petersburg with a complement of very lucky passengers. Lynx is a re-creation (completed in 2001) of an actual privateer named Lynx, built originally in 1812 in Fell’s Point, Maryland. 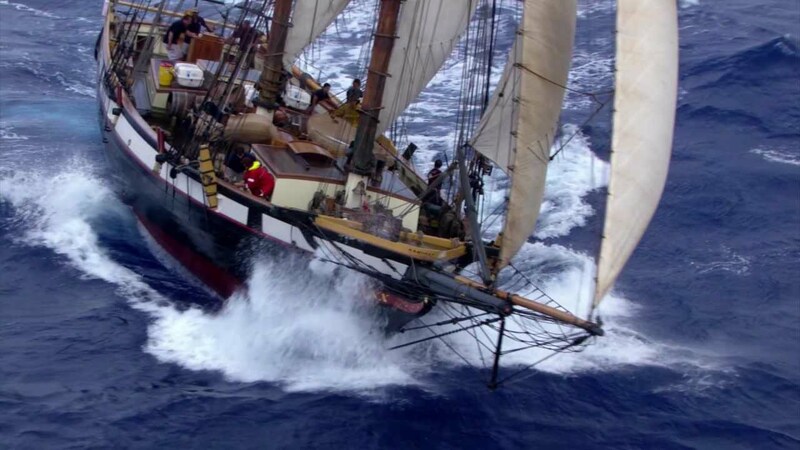 During the War of 1812 she was among the first ships to defend American freedom from the invading British naval fleet which blockaded American ports. 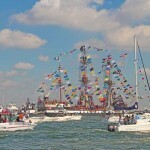 We took this opportunity to sail on the Lynx the day following the Gasparilla invasion. 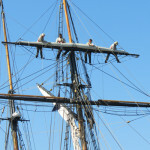 What a treat to see such a magnificent ship under sail! 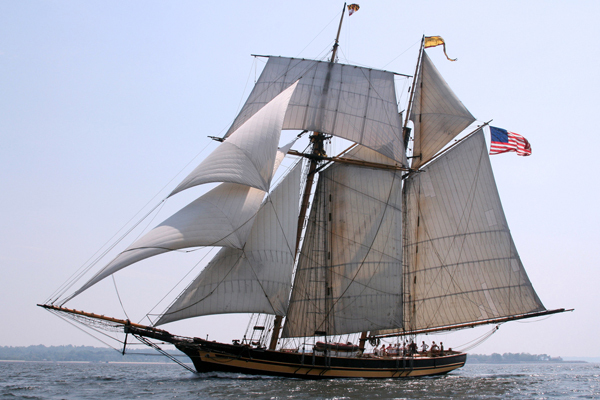 The Lynx is owned and operated by the Lynx Educational Foundation, which is a non-profit, non-partisan, educational organization, dedicated to hands-on educational programs that teach the history of America’s struggle to preserve its independence. Check out this excellent video about this majestic ship. Also see additional photos of the invasion on our Pinterest page. 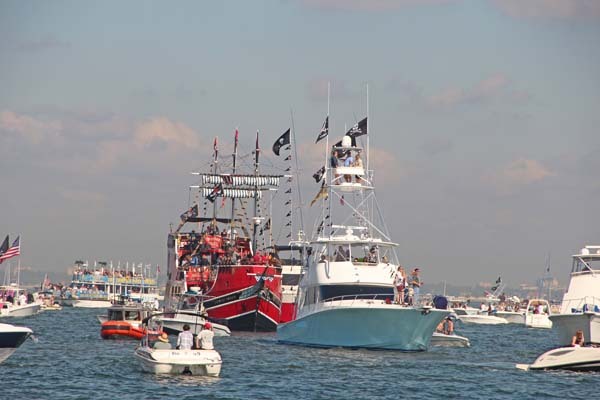 The Gasparilla Pirate Fest is a mainstay of Tampa’s social calendar. 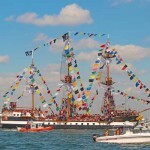 Held each year in late January (some years early February) since 1904, the Gasparilla pirate ship invasion and parades bring between $20M – $40M of booty into the city’s coffers, according to a 2007 study. 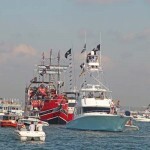 This year’s festival and pirate invasion on January 26 saw over 300,000 spectators according to official estimates. Jose Gaspar, flagship of the fleet. 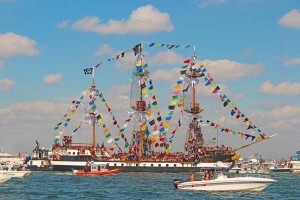 Most people experience Gasparilla from the parade routes, watching the fabulous floats and gathering the sparkling booty. 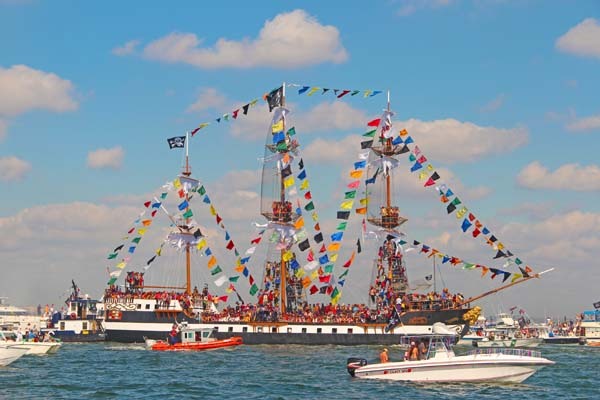 Parade watchers, however, may miss the invading fleet of thousands of boats, lead by the pirate ship Jose Gaspar, as they storm Tampa’s waterfront and take possession of the Key to the City. As the armada crosses Tampa Bay enroute to the channel along Davis and Harbor Islands, it is out of easy viewing range for most spectators. 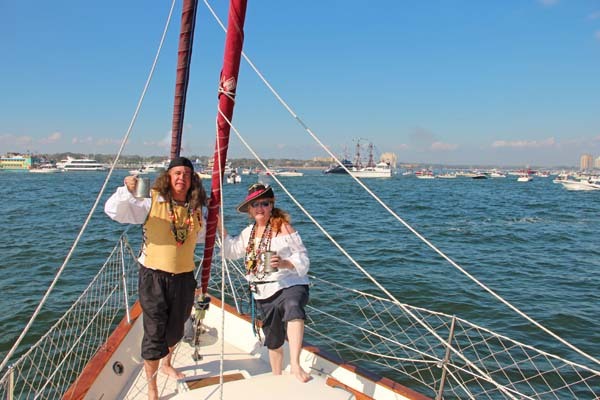 This year the crew (“krewe”) of Olde World Sailing Line boarded the Lionheart to lend firepower to the Jose Gaspar and fleet. Land bound crowds see only the final 20% or so of the spectacular convoy from the sea to city-center. I hope you enjoy these photos of our up close and personal encounter with the floating hoards. 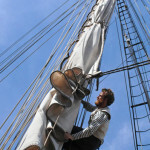 Check out the additional photos with on Olde World Sailing’s Facebook and Pinterest pages. 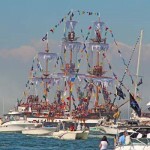 Also see the Gasparilla section on the Gallery on this website. More to come . . .
It’s Not the Size! It’s the Enthusiasm. 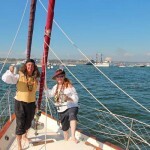 Among the very special joys of sailing are the interesting places and fascinating people you often stumble upon when least expected. Such was the case this weekend walking the extensive shoreline dock of Port Salerno, near Stuart, Florida. 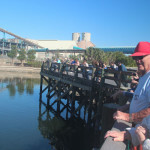 The dock, which extends for what seemed like a half-mile or more, is on the west shore of an anchorage called Manatee Pocket. Dozens of sailboats of various descriptions anchored throughout the Pocket. But it was the docks that drew my attention this day. 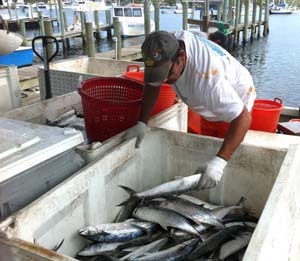 Several commercial fishermen were unloading catches from small net boats, filling the dock with large iced containers of Spanish mackerel and other fish. They were then quickly loaded onto commercial refrigeration trucks that were bound for local fish houses and restaurants. Several friendly fishermen noticed our interest and offered us beautiful Spanish mackerel, but unfortunately we were unprepared to transport them. Further down the dock I met fisherman entrepreneur, Bruce Stiller, who was loading brand new netting onto his vessel with the help of his two crewmen. Sharks destroyed a section of his old net, Bruce explained. As delicate an operation as it appeared to be loading the fine netting from his truck onto the boat, I was surprised at his willingness to engage in conversation. Bruce explained that several years ago he built his own dock, along with adjacent water well and electric, then donated it to the county as part of the larger public fishing docks so everyone can enjoy them. In return he received a permanent irrevocable lease protecting his livelihood as future politicos come and go. “I’ve been fishing these very waters since I was a kid”, he said. 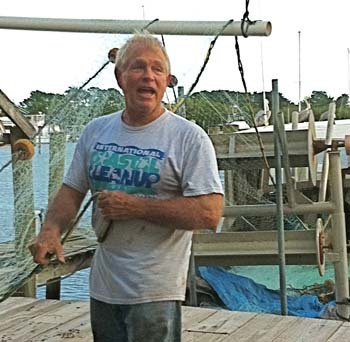 Following in his family’s footsteps, Mr. Stillman now owns two boats that ply federal waters in search of Spanish mackerel, blue fish, and small sharks. The near-shore deep water on Florida’s east coast, allow the netters to go out and return daily without the need for multi-day trips. “Fishing is my heritage”, Bruce explained proudly. He related that one day as he was scooping up the heavy nets a young guy told him he was going to get a good education so he wouldn’t have to work like that. Bruce told the boy, “…don’t ever feel sorry for me. I did go to college and I am doing exactly what I set out to do. It is hard some days, and I don’t like every single job that needs to be done (like in every other profession), but I love being a fisherman and I can’t imagine doing anything else. I have fed tens of thousands of people with my catches.” Bruce is a very lucky man. How many people can say the same about their job? 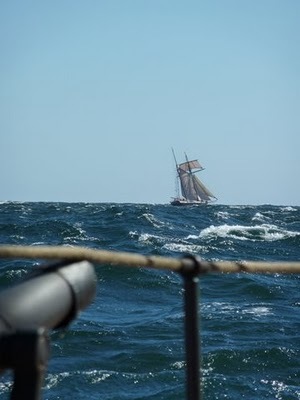 As recreational sailors who receive such joy from “messing around in boats”, it’s inspirational to reflect upon our “heritage” of those who make their living from the sea. 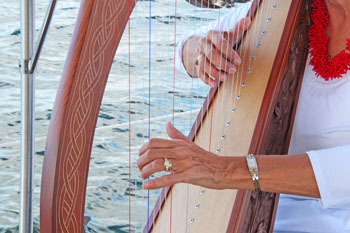 What interesting people have you encountered along our waterfronts? Favorite places? Bruce acknowledged that most regulations are two-sided coins, with pros and cons depending on your point-of-view. 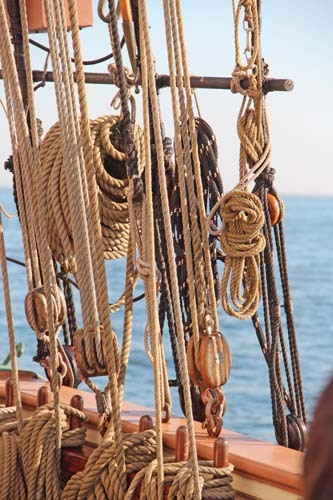 Do you see other sides to these or other maritime regulations? 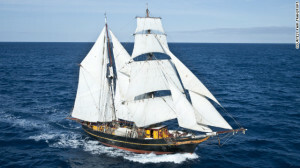 https://oldeworldsailing.com/wp-content/uploads/2018/02/Old-World-Sailing-Line-Logo.png 180 180 Captain Mac https://oldeworldsailing.com/wp-content/uploads/2018/02/header3.png Captain Mac2012-12-11 14:53:142012-12-12 06:01:15"Don't feel sorry for me. I've fed tens of thousands"